It's a bird! It's a plane! It's...Play Cole! Steal from the mob. Wind up dead. Duh. A380 Evacuation: Run Away! Run Away! Tonight, I could the tail end of a new reality show called "The Next Big Thing." It's basically an American Idol for impressionists. And it's on network TV. Yes, it is as bad as it sounds. American Idol is a better show. So You Think You Can Dance is a better show. The highlight of the show was the David Letterman impressionist. He wasn't very good. He basically had the laugh down, but that's about it. But the same guy appeared at a corporate event I attended. He told some of the same jokes. At the corporate event, though, he seemed even more awkward. Like he was having one of those "What am I doing with my life?" moments. I'm sure he thought looking like Dave was cool for a while. And maybe a good way to meet girls. But while he sat through an awkward top 10 list, after doing a monologue to a rather quiet audience, you could almost hear his brain going, "This is my career?! Really?! 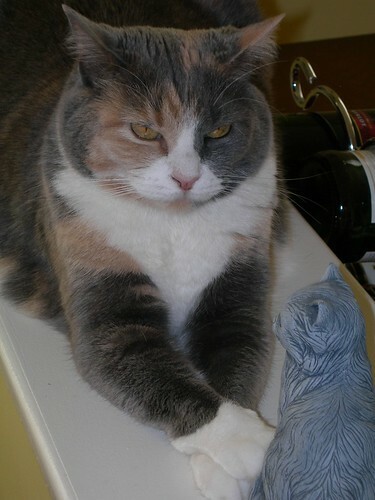 I'm going to kill the guidance counselor." Anyway, good luck, Fake Dave. I hope things work out. I just learned there are actually 6 senses, rather than 5. There's a reasonably well-accepted sixth sense (or fifth and a half, at least) called proprioception. A network of nerves, in conjunction with the inner ear, tells the brain where the body and all its parts are and how they're oriented. This is how you know when you're upside down, or how you can tell the car you're riding in is turning, even with your eyes closed. It's part of a recent Wired article (available on line) that explores different ways of enhancing the senses that people have. The implications for those who want to treat disabilities or those who simply want to enhance the human mind and body are fascinating. For six weird weeks in the fall of 2004, Udo Wächter had an unerring sense of direction. Every morning after he got out of the shower, Wächter, a sysadmin at the University of Osnabrück in Germany, put on a wide beige belt lined with 13 vibrating pads — the same weight-and-gear modules that make a cell phone judder. On the outside of the belt were a power supply and a sensor that detected Earth's magnetic field. Whichever buzzer was pointing north would go off. Constantly. Direction isn't something humans can detect innately. Some birds can, of course, and for them it's no less important than taste or smell are for us. In fact, lots of animals have cool, "extra" senses. Sunfish see polarized light. Loggerhead turtles feel Earth's magnetic field. Bonnethead sharks detect subtle changes (less than a nanovolt) in small electrical fields. And other critters have heightened versions of familiar senses — bats hear frequencies outside our auditory range, and some insects see ultraviolet light. We humans get just the five. But why? Can our senses be modified? Expanded? Given the right prosthetics, could we feel electromagnetic fields or hear ultrasound? The answers to these questions, according to researchers at a handful of labs around the world, appear to be yes. It turns out that the tricky bit isn't the sensing. The world is full of gadgets that detect things humans cannot. The hard part is processing the input. Neuroscientists don't know enough about how the brain interprets data. The science of plugging things directly into the brain — artificial retinas or cochlear implants — remains primitive. This Choice Hotels/Johnny Cash match up shows a family of 4 travelling the country. This one is interesteing because the focus is less on the cities and more on what they are doing at the locations. There is also more "acting" in this one, as the family members "talk" to one another during the song. As such, it is more of a departure from the Johnny Cash version than we've seen in the past. Choice Hotels. We'll see you there. For the past few years, Choice Hotels has been "celebrating" the memory of Johnny Cash. For awhile, they used Johnny's rendition of "I've been Everywhere" to promote their various hotel chains. A couple years ago, they began writing their own lyrics. In February, I posted the transcript from a commercial featuring an older couple singing about their travels across the USA. Here are the lyrics for the new commercial featuring what appears to be a 20-something couple travelling the USA. LAS VEGAS -- There's lazy, and then there's Las Vegas lazy. In increasing numbers, Las Vegas tourists exhausted by the four miles of gluttony laid out before them are getting around on electric "mobility scooters." Don't think trendy Vespa motorbikes. Think updated wheelchair. Forking over about $40 a day and their pride, perfectly healthy tourists are cruising around Las Vegas casinos in transportation intended for the infirm. "It was all the walking," Simon Lezama, 27, said as he sat on his red Merits Pioneer 3. Lezama, a trim and fit-looking restaurant manager from Odessa, Texas, rented it on day three of his five-day vacation, "and now I can drink and drive, be responsible and save my feet." Michelle Bailey, a slender, apparently healthy 22-year-old, used a scooter to get around a recent pool tournament at the Riviera hotel-casino. "Four-inch heels," she explained with a laugh, pointing to her lipstick-red pumps. I was kind of appalled when I first read this. The more I think about it though, the less I have a problem with it. In city know for being an adult Disney Land, why not rent a wheel chair? The entire tourist trade is all about self indulgence, whether it's the food, the loding, the gambling, or the entertainment. If people want to really spoil themselves, go for it -- in Vegas. Just don't run over my foot. Oh, and if you are riding a wheel chair because you're lazy, and you are actually physically fine, leave the chair in Vegas. I beat Paper Mario for the Wii tonight. It's the firs video game I've played to completion that I remember. I usually get stuck and then distracted with my various games, so this was definitely an accomplishment. It only too 40 hour and 12 minutes of game play to get there, too. And then I got home and found a new episode of Studio 60 on the Sunset Strip sitting on my Tivo. I imagine NBC is running out the remaining episodes they have because I'm pretty sure the series is still cancelled for next season. It was an odd episode. They featured Allison Janney as a guest star and host of the fictional sketch show. I thought it was pretty off for Janney to play herself, since she previously had a recurring role on the show as a reporter doing a story on the cast. But as it turns out, she has never been on this show before. The recurring role was played by Christine Lahti, former star of Chicago Hope. Apparently a lot of people make that same mistake because they even referenced it in this episode. Actually, I'm still convinced Lahti and Janney are the same person. The other thing that made it odd is that Matthew Perry, Bradley Whitford, and Amanda Peet, the three stars of the show were conspicuously absent. I don't know if they had a break negotiated in there contract, or if NBC threw this episode together on short notice and couldn't get them back. Or maybe there is lingering tension between Janney and Whitford from their West Wing days. Regardless, it was bizarre to not have them on the show. But they are supposed to be back in next week's show. And that's the really good news. Studio 60 is back. At least for one more week. Students today have so much stuff, they are abandoning dumpsters full at the end of school. There are some interesting aspects to the volume of stuff college kids discard. Some find anthropological significance in the mixture of the odd and humdrum. A typical catch might include "hula hoops, dishes, a can opener, a couple of condoms and notebook paper," said Kim Yarbray, environmental sustainability coordinator at Guilford College, also in North Carolina. She sees it as a kind of symbol of the intersecting stages of life of college students: childhood playfulness, adolescent experimentation, the first tools for adults who must work and take care of themselves. "Their whole life is right there," she said. "You can just see it in the things they choose to discard." But mostly it's just an amazing volume of stuff they spend money on and then just get rid of some summer time. DAVIDSON, North Carolina (AP) -- With 1,700 students, Davidson College may be small. But you'd never know it when you see the stuff students leave behind at the end of the year. In a large room at a fraternity house, stacks of clothing, furniture, lamps and electronics were already piling up days ahead of last Sunday's graduation. Mixed in were odds and ends that could only wind up together in a college trash pile: a pair of giant Homer Simpson slippers; a collection of Pokemon cards; a batch of fashion disaster dresses you can only hope were costumes from a campus theme party called the Five Dollar Prom. College students have more possessions than ever, and in the frenzy of finals, commencement and last-gasp partying before the end of the school year, little time is left for an orderly move. Purging is often easier than shipping or storing. Davidson isn't the only college trying to put its student left-behinds to better use. Next Saturday, up to 10,000 people are expected to descend on Penn State's Beaver Stadium to pick their way through 62 tons of student detritus at the annual "Trash to Treasure" sale, which has raised more than $200,000 for the United Way. Boston College collects up to 100,000 items annually for dozens of community groups. In the 15 years since its program started, the University of Michigan has channeled 123 tons of "gently used" student gear back to the community. Programs also have sprung up in recent years at numerous other schools, among them Tufts, Santa Clara University, the University of Colorado, Furman University and Carleton College in Minnesota. Sometimes, student environmental groups are the driving force. But many colleges like the idea, too -- at least more than paying to haul it all away. Mostly, however, the left-behind items are the predictable, timeless staples of college life: casual clothes, low-grade furniture, countless unopened Ramen noodles. Penn State's sale features about 4,000 carpets, along with stacks of sweaters and T-shirts running down a row 100 feet long and 3 feet wide. From the USA Today -- March 27, 2012. Source: Journal of the American Medical Association. Data first published Februay 23, 2012. And I don't mean the political kind. I never believed real rainbows existed when I was growing up in New York. I though they were nothing but hyperbole, sort of like those "Purple Mountains." Sure, I'd seen them in the random oil spill in the street, but I never saw those long arcs of color until I moved to Helena, MT. We don't usually get the kind of rain that causes rainbows in western Washington, but we did this weekend. ...is not nearly as smart as she looks. Or glasses. They can wrap around my head, or be like traditional glasses. Perhaps it's a monocle. Or perhaps it's just a small projector that uses my retina as a screen. I can plug this device into my computer. I will get a minimum resolution of 2048 X 1536. And it will look like I'm standing in front of a 72" display. It will be comfortable for hours of use. They will have their own power source -- probably a AAA battery or two. It should get a minimum of 10 hours on a single charge. And maybe it should also have the option of AC power. I want this for several reasons. First, I want to use it on an airplane. Using it to work on the plane will help with security. I can use these goggles to see my data, and no one else can look over my shoulder at sensitive information. It will also be easier to work with data. I won't be straining my eyes to see small text. With that virtual 72" display, I can see a lot more at once than I can on my smaller 12.1" display. It will make work easier and less tiring. It will also mean I can work longer. I can turn off the display on my notebook. The screen on a notebook typically draws much of the battery power. Since I am using the goggles rather than the screen, the battery will last longer. I also want to use them to watch TV or movies on the plane. Some material on TV may not be appropriate for viewing in an airplane. CSI, for example, can get pretty graphic. Those who are squeamish may not be able to handle the gore. When I wear the goggles, I won't have to worry about what the person sitting next might see when they glance over at my screen. I will also get lost in my programs more easily. Sitting in coach can be uncomfortable and annoying. I prefer to disappear into a great TV program on my notebook. The goggles will make it easier to shut out the rest of the world. Of course the plane is just the beginning. The goggles would also be great in a hotel room. The sheer size of the virtual workspace means I don't have to worry about how big my notebook screen is. It would simply make work easier. Multitasking would be easier. Working in big spreadsheets would be easier. Managing email would be easier. If these products were available, I imaging companies would use them to shrink cubicles. They would need less space for monitors. And workers could be closer together without distracting one another as each got lost in their virtual world. And I'd be willing to pay up to $800. In the newly created position, Lute would serve as an assistant to the president and deputy national security adviser, and would also maintain his military status and rank as a three-star general. The White House has avoided the term "war czar" to describe the position. Bush called Lute the "full-time manager" for the wars in Iraq and Afghanistan. The White House has sought a war coordinator to eliminate conflicts among the Pentagon, the State Department and other agencies. Lute will seek to cut through bureaucracy and deliver fast responses when requests come in from U.S. military commanders and ambassadors. It's great that the administration though about this. If only the founding fathers had thought to enshrine such a position in the Constitution -- someone with the authority to execute a military operation, manage the federal beuracracy, and who would ultimately be accountable for it and accountable to the American people. The San Jose, Calif., couple decided on a television-themed reception, which was held at a San Francisco hotel. 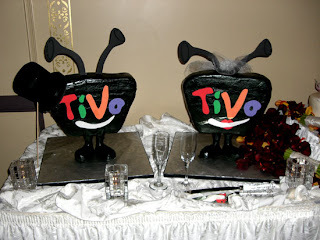 "TiVo rules our TV world," bride Tina, 37, said in an interview with CNET News.com. "We describe ourselves as a little bit crazy, a little bit weird." "Our lives are all around TV, really. All our friends know we enjoy TV. 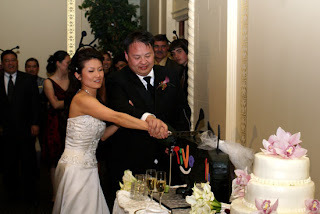 It was only fitting we got to have a TV-themed wedding," said groom Andy, 34. Plus, he laughed, "I knew TiVo before I knew Tina!" But did they get the lifetime subscription or are they on the month-to-month plan? Alaska Airlines has been ordering their new 737-800s with Winglets. They are also putting them on a number of older aircraft as those planes go in for routing maintenance. They cost less than a million dollars to install. These 8 foot tall wing tips reduce fuel consumption by up to 5%, reduce emissions, decrease the noise a plane makes, increase payload capacity, and improve climbing performance. The immediate impacts are small, but over several years of flying, they significantly improve the bottom line for the airlines. On top of the performance improvements, though, the size and elegant curve they have makes them a beautiful example of industrial design. They just make the aircraft look better. More information about Winglets is available here and from Boeing. Tonight I went to my first Buffy the Vampire Slayer Sing-a-long. In the spirit of the Rocky Horror Picture Show, the crew rents out a theater and welds live action and video together. They play the ground-breaking episode, "Once More With Feeling" on the big screen, while the crew acts it out in front of the screen. And since it's a musical episode, they encourage the audience to sing. And that's where the real joy in this outing is. Depsite being one of the best 50 minutes of television ever, it's really the fans who make this a great event. During one scene the audience blows bubbles. During another they accompany Buffy on the kazoo. And, contradicting months of theater etiquette, they encourage the audine to pull out their cell phons during one character's song and sway left and right wiht them. The audine was great, but the group of people I was with, including Jon and Renee seemed to be some of loudest folks there. And you could't find a better group of people to go to a show with. The crew worked to rev up the audience before hand, as well. The actress playing Dawn (who bore an uncanny resemblance to Michelle Trachtenberg) got an early start. She came out while everyone was waiting on line to get into the theater and tried to drum up some Dawn support. And now it looks like they are coming to Seattle at the end of June. I'll try looking for tickets next week. Rather than spend a few hours going over the various details, I'll just say there's more information about the experience at the Buffy Sings site. And go see it when it's in your area. We don't have Bennigan's in many of the cities I travel to. So when I'm on the road and have a chance to eat, I jump at the chance. I almost always get the same thing -- a Guinness and Monte Cristo or Coffee and Monte Criston. So I was thrilled when I saw the Bennigan's on RTE 22 this morning. I knew where to go for lunch. The Monte Cristo has Turkey, Cheese, and Ham (I think). It is deep fried and then sprinkled with sugar. I think it's illegal in Chicago. Here is today's. For some reason, I haven't been able to finish one yet. Between what I watched on my notebook on the plane today, and what I watched in my hotel room, I am on my 5th or 6th hour of a Law and Order program. BTW, Detectives Goren and Wheeler rock. SCIENTISTS have devised a way to cram a good night’s kip into THREE HOURS. 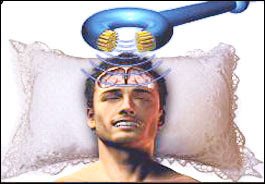 They have created a machine placed above the head like a “cap” that puts wearers in deep sleep. It could mean we all might one day wake up refreshed after just a few hours in the sack. Okay. It will probably give you brain cancer. Or stop you from dreaming and drive you insane. Or make you go bald. Or erase any computer hard drive your head gets near. Or cook your Hot Pockets while you sleep. Or make you sterile. Or allow the CIA to take control of you. But imagine -- being awake for 21 hours a day, everyday, and still getting a full night's sleep. This is just too good not to be true. Steve Chapman writes an intersting article about the gender gap in pay. New Year's Day is called that because it begins a new year, and Thanksgiving has that name because it's an occasion for expressing gratitude. But Equal Pay Day, observed this year on April 24, is named for something that, we are told, doesn't exist -- equal pay for men and women. The National Committee on Pay Equity used the occasion to announce that among full-time workers, women make only 77 cents for every dollar paid to men. The three leading Democratic presidential candidates have all endorsed legislation to fix the problem. In reality, that's not clear at all. What we know from an array of evidence, including this report, is that most if not all of the discrepancy can be traced to factors other than sexism. When it comes to pay equity, we really have come a long way. Link originally found on Fark.com. We managed to track down Nintendo Wii at Target last weekend. Somehow, between last Sunday and today, I logged nearly 20 hous on Super Paper Mario. And I was out of town for three days. NEW YORK — Thomas and Rosemarie Uva were not exactly criminal geniuses. The couple liked to rob Mafia-run social clubs in Little Italy and elsewhere around the city, which, as just about everyone knows, is a good way to get killed. They even had the audacity to force mobsters to drop their pants as they swiped their cash and jewelry and cleaned out their card games. The holdups proved predictably hazardous: The Uvas got whacked on Christmas Eve 1992. Corozzo noted that the government was relying on an unsavory cast of Mafia turncoats to make their case, including former Gambino capo Michael "Mikey Scars" DiLeonardo, who got his nickname as a child after a dog bit him in the face. I became politically aware in the late 70s. The first two national stories I recall were the oil embargo (I'm told I used to line up all my toy cars and trucks in the living room and play "Gas Line") and the Iranian hostage crisis. I had solutions to those problems in mind. The solution to the oil embargo was to ban auto racing. The solution to the Iranian hostage crisis was to drop an Atomic Bomb in the Iranian dessert. If they didn't release the hostages that day, we would drop another A-Bomb the following day, a little closer to Tehran. Each day we would drop an A-Bomb closer until they either released the hostages or we destroyed Tehran. Either way, the problem would be solved. They seemed like good ideas to a 9-year-old. While I knew the general story of the 52 hostages held for 444 days, I didn't know the story of 6 Americans who escaped the Embassy the day it fell and fled through Tehran for days before finding secret refuge with the Canadian Embassy. This month Wired has a fascianting story of how the CIA rescued those 6 Americans and snuck them out of Iran, right through the airport. It's a story of disguise, tenacity, and a fake movie studio. The details of the cover story are amazing. For the operation in Tehran, his strategy was straightforward: The Americans would take on false identities, walk right out through Mehrabad Airport, and board a plane. Of course, for this plan to work, someone would have to sneak into Iran, connect with the escapees, equip them with their false identities, and lead them to safety past the increasingly treacherous Iranian security apparatus. And that someone was him. You can read the story online, or pick up a copy of this month's issue. It's the one with Furture Hiro Nakamura (Masi Oka) on the cover. This the evacuation test for Airbus's monstrous A380. They got more than 800 people off the aircraft in 77 seconds. Of course in a real emergency there would be other issues (such as random human behaviour) and most flights won't have the benefit of flight attendants yelling at passengers in German. On the flip side, most A380 customers "only" plan to put 555 passengers in it.